Wound infections usually occur in individuals who have an incompetent immune system due to conditions such as diabetes, old age, HIV, malnutrition or prolonged hospitalization. The infections are characterized by redness, warmth and tenderness at the site of the wound, pus and fever. It may spread to other parts of the body and cause septic shock, heart failure and death. The treatment depends on the type of wound, severity of the infection and age of the patient, and may involve antibiotics and surgery. Certain herbs such as turmeric may also help control wound infections. Turmeric is a flavorful yellow powder obtained from the finger-like underground stems of the Curcuma longa plants, native to South Asia. It has been used traditionally to add color to Indian curries and contains vitamin C and E along with a biologically active compound known as curcumin which is responsible for the immense medicinal value of turmeric. Turmeric supplements are available as powders, capsules, tablets, tincture, liquid extracts and ointments, and have been used to treat several conditions including ulcers, arthritis, diabetes, heart disease and certain types of cancers. The dose is different in different people, depending on their age, overall health and condition being treated. Your doctor may help determine the dose and form appropriate for you. Wound dressing loaded with curcumin and combined with visible light radiation can help significantly lower the concentration of bacteria such as Enterococcus faecalis and Escherichia coli at the site of injury, according to a study published in the January 2011 issue of the "Journal of Pharmaceutical Sciences." Another study in the February 2008 issue of "The Biochemical Journal" suggests that curcumin can inhibit the growth and reproduction of several bacteria including Staphylococcus species, Bacillus species and Enterococcus by preventing the division of cytoplasm during reproduction. Curcumin also improves maturation and cross-linking of collagen and prevents free-radical mediated damage of the wounds, says a study published in the October 2006 edition of the journal "Molecular and Cellular Biochemistry." Turmeric supplements are generally safe to use. Prolonged intake of high doses of the supplement may, however, lead to upset stomach and ulcers. They may also lower blood sugar levels when taken along with diabetes medications. The herb may also interfere with some antacid and antiplatelet medications. 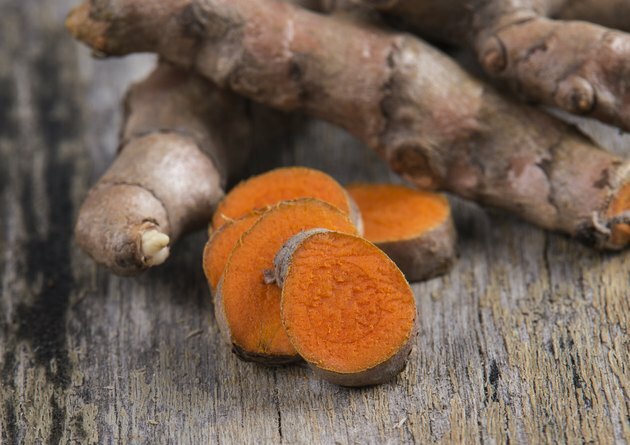 Do not use turmeric supplements without consulting a doctor. Inform the doctor about pre-existing conditions and other medications you might be taking. The Food and Drug Administration does not regulate the production of turmeric supplements in the United States. Talk to a pharmacist to find a turmeric product that is safe and effective.